13 weeks! (Note: this post was written back in July; I'm currently almost 22 weeks). At first I felt like it was going to be a boy, but now I feel like it's a girl. Andy's leaning more towards a boy because he keeps accidentally calling it "he." Honestly, we would be equally happy about either gender and we will find out next month! We kind of want to do some sort of gender reveal since we'll be in our new house by then, but we'll see! None yet, but I'm so excited for this! I've been exhausted 100% of the time. I typically take a 2 hour nap on Saturday and Sunday, and then after work I eat dinner, get in bed to read or watch tv for a bit and am asleep by 8:30 / 9pm! Sleep is on my mind 24/7. Exhaustion is my main one, with nausea coming in as a close second. I've noticed that lots of other little symptoms have popped up as well (food aversions, heightened sense of smell, vivid dreams, etc.). I'm so thankful that I didn't experience throwing up as part of the morning sickness -- it made it way easier to keep things a secret during the 1st tri! Sour / fruity candies, sparkling water, anything citrus and simple carbs seem to help with the nausea. The nausea seems to be worse if I'm really hungry, so snacking throughout the day has been key! I typically feel sick in the mornings due to hunger, and then will feel sick again in the evenings -- sometimes I just went to bed early to distract myself from the nausea. There's not much there yet, and if there is, it's mostly food-related because my stomach is still flat in the mornings. I'm up 3 pounds from my pre-pregnancy weight and I swear it's all in my chest! None yet! I've been living in these pants, these joggers, and skirts! Orange juice - this one is out of control, I literally can't get enough! For weeks 7-11, I basically lived off of smoothies, fruit, sandwiches (grilled cheese! ), cereal, popsicles, waffles, toast, bagels, chicken nuggets, and baked potatoes. SUCH a humbling experience to only be eating carbs, but it's temporary! I also had a really hard time with drinking plain water (it tasted funny to me), so I drank a lot of Gatorade and LaCroix to stay hydrated on some of the more challenging days. Once I hit ten weeks, plain water tasted normal again and I've been SO thirsty! This was so encouraging because for awhile, it was so difficult to stay hydrated in this summer heat. I'm on a prenatal (and have been since August 2017), folic acid (my prenatal changed formulas and I wanted a higher dosage of folic acid so it was the same amount as my old prenatal formula), prenatal fish oil, and vitamin D. I stopped using my progesterone cream a few weeks into the pregnancy per my doctor's recommendation. You guys, I have been down for the count on this one! I've missed working out so much but even going grocery shopping drains me like none other. I'm looking forward to getting some of my energy back now that I'm in the second trimester! This is so random, but using protein powder in my diet! After talking to my OB at my first appointment (basically just a pregnancy confirmation check and consult with the doctor) about my vegetarian diet, she suggested reintroducing white meats if I can tolerate them since I can't do whey protein powders anymore. One of the bedrooms in our new house is perfect for a nursery and we are so excited to get that all set up! We have a crib picked out, plan to add a comfy chair, and a new dresser as well! I've been using this belly butter but might switch to this one once it runs out. Mamas out there, do you have any recommendations on belly butters? 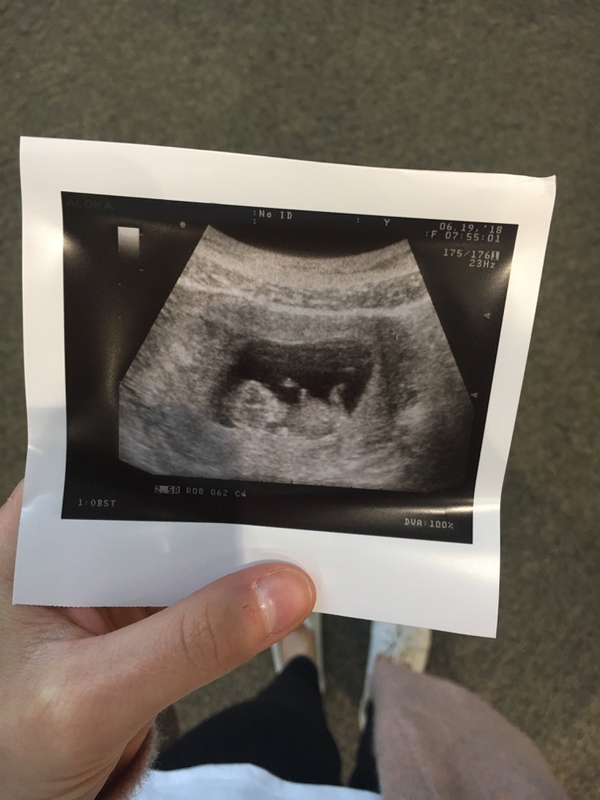 We got to see our little peanut at 8 weeks, 2 days on 6/1! I was a little nervous for this appointment, but was so relieved when my OB excitedly pointed out the little flickering heartbeat on the screen! Baby is upside down in the photo above -- you can see it's little arms sticking out under the head and it's feet at the very top. The little blob next to it is the yolk sac, which has now been replaced with the placenta. I had a really scary spotting incident at 10 weeks, but everything turned out to be okay. I'll share more about this in another post because it's definitely something I wish I would have known about before pregnancy and I think it's worth sharing. If you've been or are currently pregnant, what was your first tri like? How many kids do you have or hope to have?